When I used to work on issues of retirement security and pension policy for the Ontario government, one refrain became so common that it was largely taken for granted by my colleagues and me: The retirement crisis is an issue for the middle class only. Lower- and moderate-income people needn’t worry about retirement because the government safety net will take care of them. I have to admit I largely internalized this argument. Only recently, since Common Wealth began working with a union on a retirement plan for modest-earning home health care workers, have I formed a different view. Before explaining how I came to this perspective, let’s break down the building blocks of the conventional argument. One problem with this argument is that it lumps together two quite different groups: low-income Canadians and modest-income Canadians. And while the statements above may apply, at least to some degree, to lower-income Canadians, the picture for moderate-income Canadians is quite different. Who are “moderate-income Canadians”? Part of the problem is we lack an agreed-upon definition. Let’s say for the sake of argument that it’s a group that earns between $25k and $50k for singles and $40k to $80k for couples. It’s a group that’s more likely to be characterized by income volatility, job insecurity, and multiple part-time work assignments. Members of this group may not be middle class, but, in the parlance of the Trudeau government, they are working hard to join it. Question 1: Are moderate-income Canadians on track for retirement? Below are three ways of looking at this question: a population-level projection, a case example, and a survey of Canadians’ perceptions. Population-level analysis. The chart below, which comes from research commissioned by the federal government in 2009 and is admittedly a bit dense, shows that the retirement readiness problem can be as bad or even worse for modest earners than it is for middle-income workers. According to the analysis below, which was prepared by economist Keith Horner, a smaller percentage of modest income households (60%) are saving enough to achieve 100% consumption replacement compared to middle-income households (63%). The difference is even more dramatic for single people (44% of modest earners are on track versus 56% of middle-income people). These figures may underestimate the scope of the problem since most assessments of Canadians’ retirement readiness do not fully account for out-of-pocket health care costs such as home care and long-term care, which can be particularly onerous for modest earners especially if they cannot get access to fully-subsidized facilities. Is 50% of pre-retirement income enough to maintain one’s standard of living in retirement? The answer appears to be no. First, 50% is at the low end of what commentators think is necessary for most people to maintain their standard of living. Estimates usually range from 50–70%. Some use an even higher number (this Center for Retirement Research report uses 80%). Second, lower-income people tend to need a higher replacement rate, in part because they are more likely to be renters and therefore their housing costs will not drop in retirement, unlike middle-income home-owners who may have paid off their mortgages by the time they retire. If public programs alone are not enough to sustain modest earners’ standard of living in retirement, then some combination of private savings and workplace pensions is required. This group is much less likely to have a workplace pension than middle- or higher-income Canadians. If the person does not have a workplace pension, the private savings levels for this group (through vehicles such as RRSPs and TFSAs) appears to be quite low. Recent research by statistician Richard Shillington for the Broadbent Institutefound that families age 55–64 with incomes between $25,000 and $50,000 had average retirement assets of just $57,000, and median retirement assets of just $250, meaning there are many families with no retirement savings whatsoever (see chart below). These are deeply worrying numbers. Using the 4% rule of thumb (withdrawing 4% of your nest egg each year), retirement assets of $57,000 give you $2,280 per year, for a total of about $22,380, if we use our case example above. 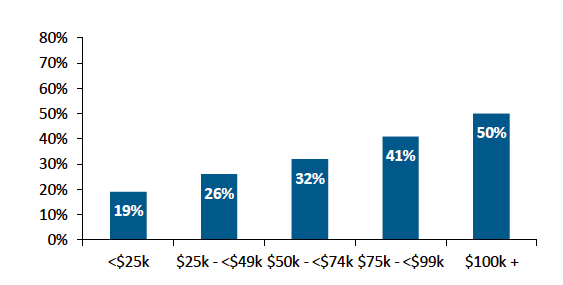 That’s a replacement rate of about 56% — arguably much too low for people in this income group. Perceptions. A third way of looking at the question is based on savers’ perceptions. How confident do modest-earning Canadians feel about being able to maintain their standard of living in retirement? According to recent research by pension expert Bob Baldwin, Canadians earning less than $50k have lower confidencein maintaining their standard of living in retirement than Canadians earning over $50k. Question 2: do moderate-income Canadians have the money and will to save for retirement? The second basic premise of the argument that the retirement crisis is only a middle-class issue is that people below the middle-class level cannot, and/or are not interested in, saving for retirement. There is no question that it is more difficult for modest earners to save than for middle- or upper-income people. They have less disposable income. Their basic costs of living — housing, food, post-secondary tuition — have, on average, increased faster than their earnings. Many of them feel squeezed by the cost of living. On this basis, it seems fair to say that modest earners cannot save as much — even as a percentage of their income — as middle- and upper-income earners. There is, however, evidence that modest earners can, and want to, save something for retirement. That amount may not be as large as what middle- or higher-income Canadians can and should save, but it is likely not zero. 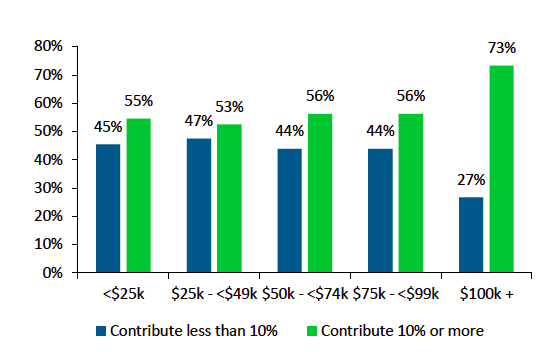 A recent study by Bob Baldwin for the Canadian Public Pension Leadership Council found that the percentage of Canadians willing to contribute 10% or more of their income to a retirement plan varied little across income groups, with a majority of workers earning between $25k and $49k, and even a majority of those earning less than $25k, being willing to contribute over 10% (see chart below). Polling of moderate-income workers that Common Wealth has conducted in collaboration with clients has shown (a) high levels of anxiety about retirement readiness; (b) very strong interest in a pension-like retirement plan; and, (c) a willingness to sacrifice near-term consumption for long-term savings. Recent cutting-edge research on lower- and moderate-income householdsin the US has shown that, contrary to conventional narratives, these households do save, but tend to do so on a “high-frequency” basis as a way of managing income volatility (see also Angus Deaton, Understanding Consumption, Clarendon Lectures (1992) (explaining the term “high-frequency savings”)). Recent data from Vanguard, which manages defined-contribution retirement plans for 4.4 million people in the U.S., found that the largest increases in retirement plan participation have been among lower-income workers. The participation rate among those eligible for Vanguard plans and earning under $30,000 rose to 65% from 45% over the past decade. New products. The current retirement market does a poor job of serving moderate-income Canadians. According to Morningstar, Canada’s mutual fund fees are the world’s highest, and lower-income people tend to pay more than others. RRSPs and registered pension plans also result in a clawback of 50% or more of Guaranteed Income Supplement (GIS) benefits for lower- and moderate-income Canadians, making these regulatory categories highly inefficient retirement-savings vehicles for GIS-eligible Canadians. There is a major need for more efficient, better quality, and highly accessible retirement benefits for moderate-income Canadians. The pension-like, Tax-Free-Savings-Account (TFSA) based my65+ plan that Common Wealth created for the Service Employees International Union is an example of such a benefit. Source: Morningstar, Global Fund Investor Experience Study (2015). More progressive tax policy. The tax benefits of retirement savings tend to favour higher-income people over lower- and moderate-income people. For instance, a $1,000 RRSP contribution results in tax savings for over $500 for a high-earner in the top income tax bracket, and $200 or less for a modest earner in the bottom tax bracket. This “upside down” structure promotes wealth inequality and is also an ineffective way of encouraging savings, since tax incentives for higher-income people are less likely to result in net new savings than incentives for lower- and moderate-income people. Governments should consider equality-promoting, more effective incentives that give an equal or larger incentive for lower- and moderate-income workers to save for retirement. The US Saver’s Credit, the Additional Canada Education Savings Grant, and the Canada Learning Bond are examples of these kinds of incentives.